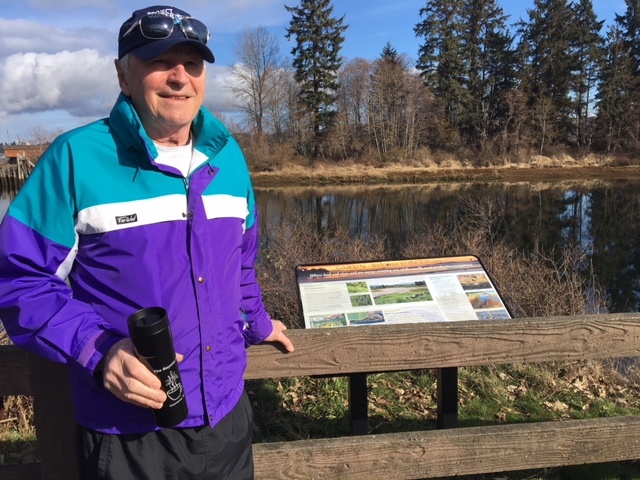 For the longest time, I have set out from the Old House to walk the spectacular trail that borders the Courtenay River and its sister K’omoks Estuary. It plays out like a movie that completely relaxes and uplifts me, that is until the very end where a parting scene delivers a bit of a sucker punch. But as I recently found out during my visit with Bill Heidrick (a new Project Watershed conservation friend worthy of a blog just about him), an amazing sequel is about to play out… and I think every Old House guest should know about it. Living alongside the K’omoks Estuary, even if only for a night or two, is a rare experience, and truly, I think it’s one of the greatest offerings the Old House Hotel & Spa offers. Whether you’re walking the coastline or peering out your window at the River, there is always a show to behold. Spectacular views — different at high and low tide — and the inner workings of an ecosystem alive with raucous, colorful displays from eagles, seals, river otters, kingfishers and fish on the run are captivating. But a piece of this paradise is amiss: a four-hectare field of concrete leftover from the old Fields Saw Mill lies just on the other side of the River. 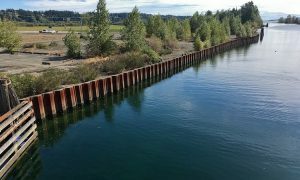 Back in the day— 1947 to be exact — an unfortunate trade was made: critical habitat that sustained salmon and other wildlife was walled off and buried to erect a lumber processing operation. The mill has long since closed but with it have gone some healthy populations of fish and vegetation. I had never walked the abandoned site, but accepted Bill’s invitation to do so upon hearing fantastic news: a restoration plan is underway. The sun, seldom seen in the past weeks, serendipitously shone on us as well as the sign posting the site’s new name: Kus-Kus-Sum (Translated, it means burial place and pronounced like Couscous-Um!) As Bill and I looked back at the adjacent robust Hollyhock flats, the barren site on which we stood seemed to long for reconnection with its other half. I could almost feel from staring up into the eagle-decorated sitka spruce and down into the clear tidal current from which it is walled, that waterways and sea grasses and chinook salmon are raring to return. And if things continue as they are going, the amazing Comox Valley community will ensure they will. 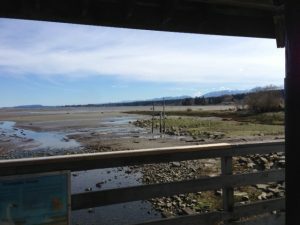 The Kus-Kus-Sum ambitious restoration plan — overseen by Project Watershed and the K’omoks First Nations and supported by an incredible list of commercial and government (including the City of Courtenay) partnerships — is to bring back the area’s original combination of salt marsh, waterways, riparian zones and forested areas. 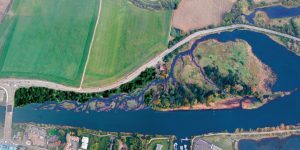 Once restored, it will provide the community with abundance in the form of wildlife habitat, flood mitigation, carbon sequestering and recreational and educational activities. The cost is $6.5 million, of which $500,000 has to be raised by the community before the end of 2019. They are more than one-fifth the way there, but they still must meet their periodic funding goals to secure the property sale. The remainder of the funds will come from grants and government programs. 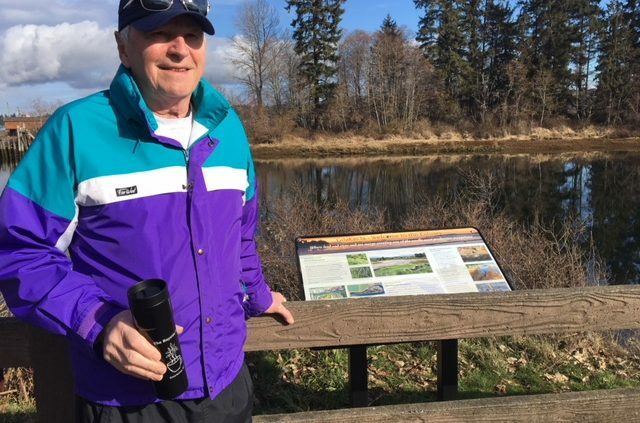 The Comox Valley community, led by the K’omoks First Nations people and Project Watershed’s amazing team (also responsible for a multitude of other nearby restoration efforts) is on a roll to “unpave this parking lot” and restore “paradise.” (Yes, Joni Mitchell, you are an inspiration still!) The fundraising events are super creative. All contributions matter to this project: small, large, matched and anonymous. 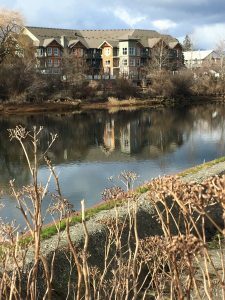 (I loved hearing about the secret gift matching donor called the “Estuary Angel.”) But I am most amazed by the tireless, passionate folks from everywhere in the Valley and beyond who are completely committed, Bill for starters. In the spirit of protecting a connected planet, helping local conservation efforts is so important. So, you’ll be happy to know that the Old House Hotel & Spa is helping the effort. Please consider donating to Project Watershed and the Kus-Kus-Sum project too! There are so many really wonderful fundraising events in store, so look them up while you’re in town. I truly hope you will be able to see restoration in action in the coming years, culminating in a place that will complete the spectacular K’omoks Estuary.